So, it has been a while since I posted. Friends, I was ashamed. 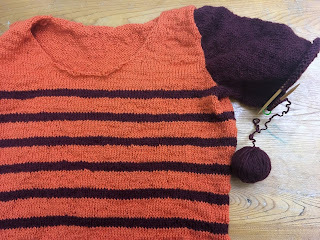 I had finished my striped sweater, after over a month of work. I lovingly wove in the end and laid it out to block, all the while ignoring the niggling voice in the back of my mind saying it looked a bit large. Oh, kittens, it was awful. Due to some incredibly strange arithmetic on my part, I knit two sizes larger than what I needed, and the result was a very woolly sack. It would have been a lovely sweater for someone larger than me, but alas, I cannot change my size. I tried to think of ways to fix it quickly, but I realized pretty much immediately that I needed to rip it out and re-knit it. So, in a week, I've knit a sweater body and half a sleeve. I am too exhausted to be mad at myself, but I'm hoping to have this pattern ready for release over the weekend. I haven't really had time to process how upsetting this is yet, because I've been so focused on re-knitting it, but based on the reactions from many of my knitting friends I will probably be weeping in a corner eating chocolates for a week once this is done.